There are some couples who touch my heart in an incredibly profound and personal way. At their rehearsal last week, Wedding Planner Megan Keller and I both agreed that we felt a little sad that our time with Chase and Christina was coming to an end. 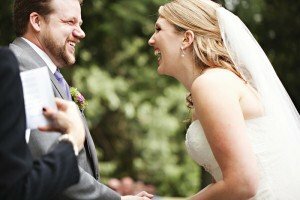 Couples often have post-wedding blues. While feeling a litle blue about letting Chase and Christina go, I was also elated for their Saturday ceremony and thrilled for the possibilities for their future. On the afternoon of Saturday, April 28th, Chase and Christina shared their love story with more than 150+ family and friends at DeLille Cellars in Woodinville. There were many ceremony highlights and I absolutely adore this photo by Photographer Jenny Jimenez taken during the sharing of personal wedding vows (held as a surprise).